Wanna spoof your voice? Voice Changer is a simple fun iPhone tool that lets you transform your voice. Tap to record and then choose from 9 sound effects to instantly distort your voice into a funny and entertaining recording. 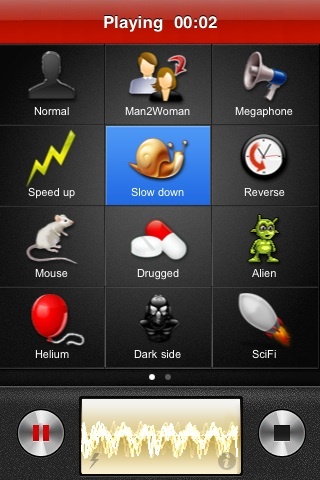 Voice Changer is a voice recorder and voice changing app for the iPhone. You can sound like a mouse, and evil demon or even speak in reverse. AppSafari review of Voice Changer was written by Joe Seifi on January 11th, 2009 and categorized under App Store, Fun, Utilities. Page viewed 10492 times, 2 so far today. Need help on using these apps? Please read the Help Page. Can you use a microphone thing for this? That a Good Application to work With……….!!!!!!!!!! @BeeMonkey: I can’t find any Voice changer app that can make ringstones. wtf? how is this compared to the other voice changer app called madmix voice changer?